Win a Wii Console! 5 Winners! 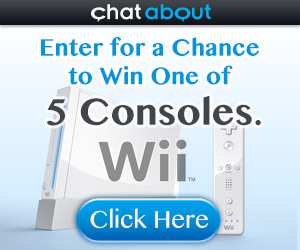 Sign up for Chat About (free of course) and you will automatically be entered to win a Wii Console! 5 Winners!! - ends July 30th. I just entered, you can sign up with your Facebook account and it takes a second. Seems like a cool site if you like to chat :):) Let me know if you win!